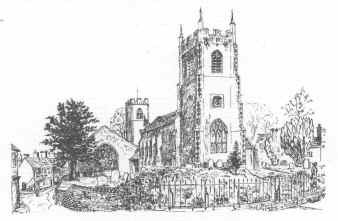 To enter a churchyard and discover two churches is a little unusual; yet in Reepham, in the past there were three. Saint Mary's, Reepham, the church of the present day united benefice; Saint Michael's, Whitwell, the adjacent church, today used for Sunday School, day centre for the elderly and for parish functions; and All Saints, Hackford, destroyed by fire in 1543. Why three churches, so close? Legend suggests three sisters each with their own church but what we are sure of is that the parish boundaries meet in the churchyard. Saint Mary's today serves the three parishes of Reepham, Whitwell and Hackford and, as the active church, continued to undergo minor changes since restoration in the late 18th century. For example, in the 1970's the organ in the south aisle was moved from the gallery of Saint Michael's while in the near future the Jacobean pulpit will be moved in a similar manner. It will be seen from the list of Rectors, from 1261, found behind the font, that the Rector of Reepham now serves an enlarged united benefice, embracing the neighbouring parishes of Sall, Wood Dalling and Thurning. Saint Michael's, Whitwell, connected by the choir vestry to Saint Mary's, remains a consecrated building where Evensong is held in the chancel bi-weekly. The bells are rung by local and visiting ringers. Like many Norfolk communities in the last ten to fifteen years, Reepham has seen the erosion of a way of life - one wonders how the peaceful invasion will be recorded in future years. With the Church being the core of national and local heritage, it is in the Reepham Churches, on a quiet afternoon, where one can still find a little of the quiet dignity that remains in these times of change. Our Suffolk coastline is unique. A largely undeveloped stretch of coast, it displays a large variety of splendid landscape and habitat. The area is one of 37 Heritage Coasts in England and Wales deserving special protection and sensitive management. 3. communicate the value and need for coastal conservation. Landowners and the local community have helped enormously in this work, but there is still plenty to be done. The wide expanse of estuary, marsh, grassland. heath and beach create a distinctive and valued landscape. They also support an abundance of wildlife, making this an area of international importance. Some of our rarer birds, such as Marsh Harriers, Avocets and Bitterns, can sometimes be sighted near reed beds and mudflats, while heaths play host to the scarce Silverstudded Blue Butterfly and Common Lizard. Changes in the countryside can spoil this landscape and its value for wildlife. Farming sensitive to the environment, with the conservation of heathland, meadows, marsh and woodland is desirable. Picturesque villages provide a wealth of fine churches and other buildings of historic interest. The squat Martello Towers, built to safeguard the nation against Napolean, are a feature along the southern part of the coast. Visitors are encouraged to explore and enjoy the coast so long as they are considerate to its special character. Care should be taken not to leave litter, and to park your car and picnic in the proper place. The Suffolk Heritage Coast Project needs your help to safeguard this unique coastline. We hear a lot, and rightly, about the need to maintain 'natural diversity' - protecting the thousands of species of plants and animals that exist, even In our small corner of the planet. But what about the diversity of the man-made environment? The character and distinctiveness of our towns and villages and cities is also precious, albeit sometimes threatened by an increasingly mass-produced modern world. If we are not careful one place starts to look like any other place in the country. This concern for local identity is one of the basic inspirations of the civic society movement. It is now one of the key features of Local Agenda 21 because it is recognised that proper respect for local identity must be a feature of a sustainable future. Local character is rooted in history, and helping a community to possess and enjoy its own story is one of the practical ways a society can draw on its strengths and contribute to Local Agenda 21. How can we plan for a sustainable future if we don't know where we've come from? How would you like to see the remarkable renovations done to repair the damage caused by the fire at Windsor Castle? Beestons Coaches are laying on an excursion later in the year and will advise details in good time for us to notify Society members. The Adult price is likely to be �l6.00 with OAPs at �14.00 each. Alternatively you can telephone the companys local office direct on Hadleigh 823243. The Ipswich Society report that the Park and Ride Scheme run from Copdock Mill appears to have begun well since its official opening on 10th November last. Certainly the pre-Christmas shoppers were making good use of it. There are spaces for 550 cars. Bob Feltwell of the Suffolk and Ipswich Chamber of Commerce was quoted as saying: "We hope it will be used by the long term shoppers, and by commuters who would otherwise leave their vehicles in town centre car parks, blocking them for several hours when they could be used by several different cars for shoppers". Five new buses have been bought for Ipswich Buses to operate, using a distinctive purple livery. The main objection to date seems to be that the substantially subsidised service makes other bus fares appear exorbitant! But the County Councils Government-approved grant cant be extended to ordinary bus routes. The band and bugles of the Armys Light Division are giving a concert in St Mary on SATURDAY 18th APRIL next at 7.30pm in aid of the Stained Glass Memorial Window Fund. Tickets, which include light refreshments, are available from Travel 2000, the Idler Bookshop, Hadleigh Cleaners or the Lions Charity Shop at �8.50 (�3 children under 14) and �10, with a limited number at �12 to include a pre-concert reception in the Deanery Tower. Further details from Society member Fred Breyer (Telephone: 01473 824996). The wealth of medieval and Tudor buildings in Suffolk and Essex represents a largely untapped reserve of archaeological information for the social historian. Relatively little research has yet been done into the social and economic change which underlies it. This day-school traces the changing nature of domesticity through the middle ages and into the seventeenth century and asks why the pace of change appears to have varied so much from one part of the region to another. Leigh Alston is an architectural and social historian of the later middle ages. Educated at Oxford, he lectures extensively for the Universities of Essex, Cambridge and East Anglia and has a particular interest in the buildings of his native Suffolk. A talk by Peter Minter at Lavenham Guildhall on 22nd April at 7 pm. Tickets, �2.50 including a glass of wine, from Audrey Poston, Woolstaplers, Prentice Street, Lavenham, CO10 9RD. Still needs some bricks, especially good flooring, and plants. SUFFOLKS residents are to be encouraged to think about the future of the county through a large-scale public consultation on the Suffolk Structure Plan, the document which sets out how the county should be developed over the next 20 years. The current Suffolk Structure Plan was originally drafted in the mid-1970s and has been updated three times since. It sets the broad framework for development up to 2006: the review will extend this time-scale to 2016. More detailed policies are contained within the local plans, produced by the district councils, which must conform to the overall county plan. The plan aims to protect the Suffolk environment, while at the same time allowing for development and growth to meet the needs of future generations. Housing and jobs are two crucial areas: the plan suggests 48,700 new homes will be needed in the county by the year 2016, and recognises business development will be necessary to provide enough jobs in the future. The figure of 48,700 is some 15-20,000 less than the figures for Suffolk coming out of the governments projections which allow for an additional 4.4 million households nationwide. Sites, with planning permission, have already been identified for 26,200 houses. Most of the rest of the sites are likely to come from small infill schemes and the re-development of existing urban sites. The plan seeks to preserve village life, keeping shops and pubs open in rural areas, while at the same time concentrating future shopping, sport and leisure development in town centres rather than on the outskirts. Transport issues are also addressed - with the focus moving away from road building and on to improving public transport and walking and cycling opportunities. Consultation, which will include questionnaires and a roving exhibition, will begin during Suffolk 21 Week - 23-29 March, when the county and seven district councils hope to raise the profile of a wide range of environmental issues. The new Chief Executive, Lin Homer, started her new job on 5th January. "My first few months are going to be pretty busy, but in addition to open meetings I hope to be out and about around the county visiting different locations and offices and seeing our service delivery at first hand." Our members (and others) sometimes ask "What are you doing about ........."
Each month the Society monitors planning applications particularly those that involve listed buildings or the conservation area of our town, make observations and when necessary formal objections to plans. From time to time the Society, together with other local organisations, is invited to join consultative groups and we are represented on the Town Forum and the "Hadleigh Traffic Management and Environmental Working Party" by our Vice Chairman, Jan Byrne. In December our committee spent an evening "brainstorming" the problems of traffic and pedestrians in the town centre. Should the High Street be one-way? Should it be pedestrianised? Should on-street parking be changed? How can traffic jams be avoided? Should there be parking bays? Are there any solutions to Benton Streets lorry problems? A number of ideas were considered, many of them to be immediately rejected but some seemed possible or at least worth further thought. These have been collated into a short paper which we have sent to all the members of the Town Forum and the TME working party. We have recently received a copy of Baberghs "Hadleigh Town Centre Health Check" with an invitation to comment on its content. Babergh D.C. has also started the early stages of consultation on the new "Local Plan". Your Committee will be meeting soon to discuss both of these topics and to formulate the Societys response, bearing in mind our Societys aims and objectives. Should you have views on any of these topics please let John Bloomfield, Jim Betteridge or Jan Byrne know as soon as possible. At our January meeting Sue Andrews took us back in time to trace the development of Bildeston and its shops. Having shown us an aerial photograph that revealed the ground markings close to the church where the early village had been, she went on to illustrate how the medieval street stalls had developed into covered stalls and then shops. The area surrounding the market, over the years developed into todays Bildeston. A pictorial tour then gave us a good impression of the shops of today and of the 19th century when Bildeston was well served with businesses, there were 3 grocer/drapers, a baker, a butcher, 3 boot and shoe makers, a dressmaker and 3 tailors. Other shops included 2 newsagencies, 2 toyshops, a hairdresser and a watchmaker. Sue then told us that in 1985 some documents had been found, walled up in an old fireplace at Bank House Stores. The documents were over a hundred years old and among them were a number of notes sent to a Mr Crickmore ordering goods or making requests. 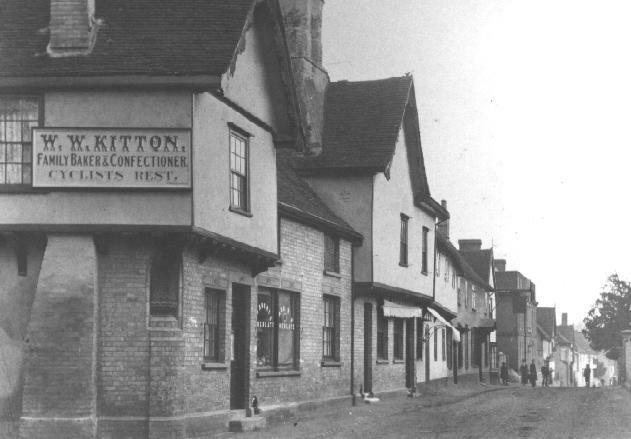 Mr Crickmore arrived in Bildeston in 1871 to take over the position of postmaster with a grocery and drapery business, he also sold wines, ironmongery, stationery and haberdashery, was an agent for an insurance company ran a telegraph office and provided a banking service. His shop served not just the town but via the local carrier and the postman, the surrounding villages. Some of the surviving scraps of paper illustrate this. "Would you be so kind as to send me two rolls of butter tomorrow by Cresswell by so doing you will greatly oblige" (James Cresswell was a local carrier). Notes seem to have been the standard way of communicating. "Will you oblige me by taking some butter of me on the account of we are not going to let Mr Gibbs have any more, for his son have proved very dirty about butter and, if you please I will have a book and settle it up every 3 months. Please to send me a note if you will agree to it and I think I shall have some butter in a months time and eggs too. Yours truly, Mrs Baldry, Naughton"
From the Old Manor, Chelsworth came a note saying "Miss Pocklington would like Mr Crickmore to get 45 yards of the same carpet that he has just got for Miss Cautley and a rug to match. Miss Pocklington lets Mr C. know at once in order that he may secure the quantity.". Sometimes customers made mistakes and hoped Mr Crickmore would get them out of trouble. "I found I made a great mistake in sending for half pound of ground mace for 3 ounces would have been a plenty for me, so if you can help me out of this scolding I hope you can do so. It is a thing that will be sure to sell this time of the year, as Mr Gedge will be surprised when he sees what it cost. I had no idea it was so expensive. I have sent it as I feel sure you will take part of it back"
Telegrams were dispatched, often with Mr Crickmores help with the wording. Dear friend Unforeseen events have occurred. Could you pay us a visit at some future time? I am sorry. Would you please send this telegram. If you think it would be better put in any other form, will you please alter it. Send word by the postman how much it is and I will send the money." These are only a few of the many originals messages that Sue used to illustrate her talk but she ended by telling us that at the turn of the century Mr Crickmores son Harry took over the business so the people of the town and surrounding villagers were still able to go on writing "Mr Crickmore please to send............". From the beginning of this year the Newsletter has been published on the Hadleigh Society Internet Site, with the advantage that many pictures show their original colour. This is intended as a long-term project so that over the course of the years we will have built up a wealth of material that is readily accessible from anywhere in the world and may serve a variety of interests. If you want to see what we've collected so far you will find the World Wide Web address at the end of this Newsletter. All you need is a computer with an Internet connection. We are switching the informal noon-day meetings held every 4 weeks from the George to the Town Council offices where we have access to plans, etc. Do call in for a look see and put yourself in the picture on current planning matters. If you have the time, join us for some pre-lunch refreshments.